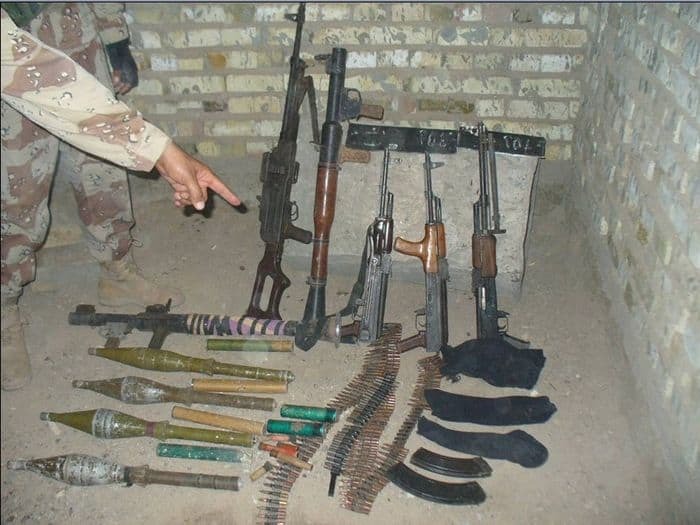 Weapons cache at Al Anbar University in western Ramadi. CAMP RAMADI, Iraq – The Iraqi Army and Coalition forces searched Al Anbar University in western Ramadi Wednesday in order to clear the campus of insurgents and bomb-making materials. IED materials and weapons, including sniper rifles and RPGs, were found on the university grounds by Coalition forces. The search was conducted by Iraqi soldiers from the 1st Brigade, 7th Iraqi Army Division; tanks from 2nd Brigade, 9th Iraqi Army Division; and U.S. Soldiers from the 1st Battalion, 35th Armored Regiment. Iraqi army military police will maintain a guard post outside the university to provide security until Iraqi civil police are prepared to assume the task. This is a continuation of operations that Coalition and Iraqi Security Forces have conducted for the past several months and is just one part of a long-term plan to restore stability to Ramadi. Coalition forces are working daily with the ISF to improve conditions for the people of Ramadi. The ISF are playing a vital role in these operations. 1/1 AD assumed responsibility for the greater Ramadi area June 11 from the U.S. Army 2nd Brigade Combat Team, 28th Infantry Division. The 1/1 AD spent the previous five months in Tal Afar, northwest of Baghdad, and is deployed from its home base in Friedberg, Germany.